We all know and sing “Silent Night” at Christmas time but there was one special night in history when the singing of the beloved carol was exceptionally meaningful to the people singing it. That happened on a cold night in Belgium when the German and Allied soldiers decided to stop fighting on Christmas Eve 1914, in defiance of their commanders. 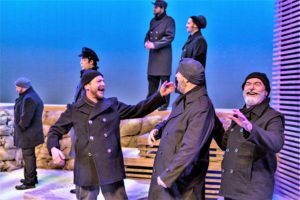 This unique story is movingly told in the play “All Is Calm: The Christmas Truce of 1914” currently playing at the Public Theater of San Antonio through Dec.23. Though the play has been around for a few years, it is a most fitting contribution to the 100th anniversary of the Armistice of Compiegne which ended the war that reshaped the map of Europe in 1918. And 2018 also happens to be the 200th anniversary of “Silent Night,” composed in 1818 by Franz Xaver Gruber. To mark both anniversaries in a very public way, the cast of “All Is Calm” will perform “Silent Night” in front of the Alamo this Wednesday, Dec.5 at 7 p.m. The ensemble of 12 men will deliver the song in four languages and 8-part harmony. “With this performance, the Public Theater honors our American soldiers who have fallen fighting for our country,” says the company’s release but it seems to be a tribute to hope and peace as well. Let’s indeed sing “Silent Night”!